This year marked the 74th anniversary of the Battle of Midway, one of the most pivotal events of the Second World War. 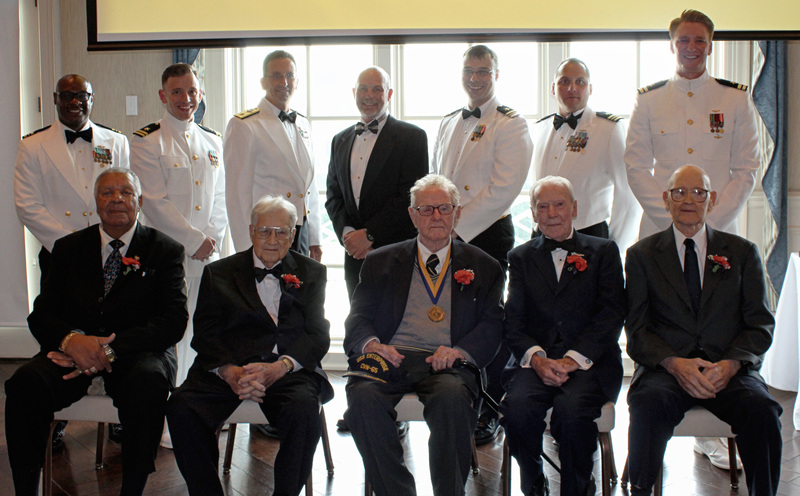 VIPs, invited guests, active duty military, and veterans once again braved foul weather to attend the annual Battle of Midway Celebration Dinner at the Army Navy Country Club in Arlington, VA. This was the 16th year that Navy organizations came together to honor and commemorate those who fought in the historic event so many years ago. In 1999, then Chief of Naval Operations Admiral Jay Johnson sent a message to the Navy to commemorate both the 13 October Navy Birthday and the 4-7 June Battle of Midway. 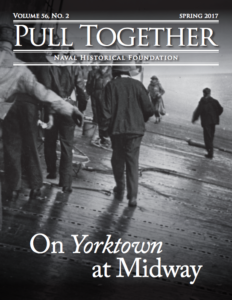 Organizers quickly banded together to help make the commemorative occasion a fitting testament to the honor, courage, and commitment of an outgunned and outnumbered American fleet displayed that would eventually turn the tide of the war. Years later, Navy commands around the world continue to gather each year to remember the service and sacrifice of Midway sailors in what Admiral Chester W. Nimitz called, “a glorious page in our history.” The dinner itself has grown since then to become an annual hallmark within the academic, military, and veteran communities in the Washington, D.C. metro area. Many distinguished guests, both civilian and active duty, attended this year’s celebration, including former Secretary of the Navy Will Ball, Deputy Chief of Naval Operations for Integration of Capabilities and Resources Vice Admiral Joseph Mulloy, USN, Carrier Strike Group Three Commander Rear Admiral Ronald Boxall, and Rear Admiral David Hahn, who is the senior technical advisor to the Deputy Chief of Naval Operations for Information Dominance, representing the Chief of Naval Operations. NHF Chairman Admiral William J. Fallon, USN (Ret. 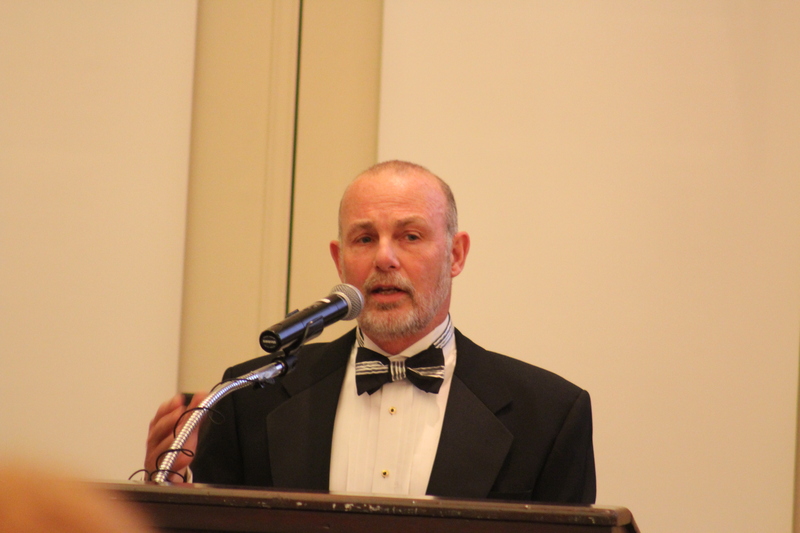 ), and President Rear Admiral Bud Langston, USN (Ret. ), were also in attendance. The dinner committee also recognized General Earl Anderson, United States Marine Corps, a Midway veteran of carrier Yorktown who passed away in November of last year. 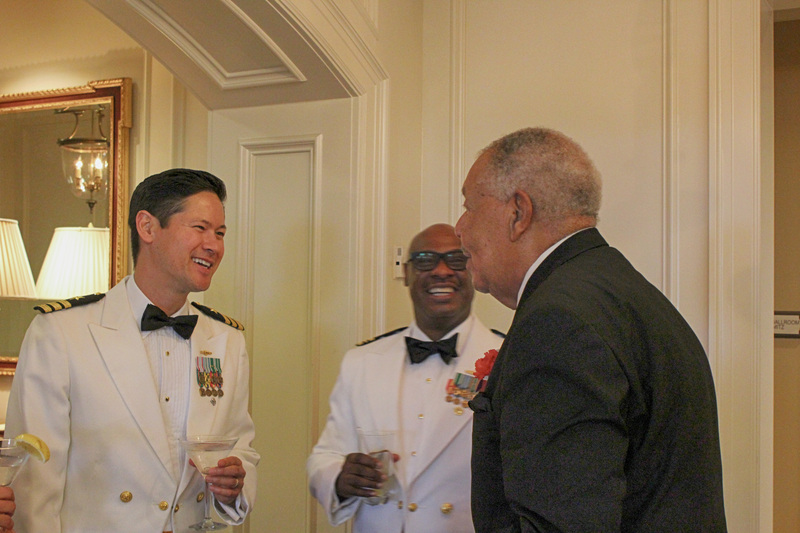 General Anderson attended the 2015 Battle of Midway Commemoration Dinner. Although never a guest at the Washington, D.C., dinner, the committee felt it appropriate to also remember Captain Jack “Dusty” Kleiss during the introductions. Kleiss passed away in April this year at the age of 100. He was the last surviving SBD Dive Bomber from Midway. 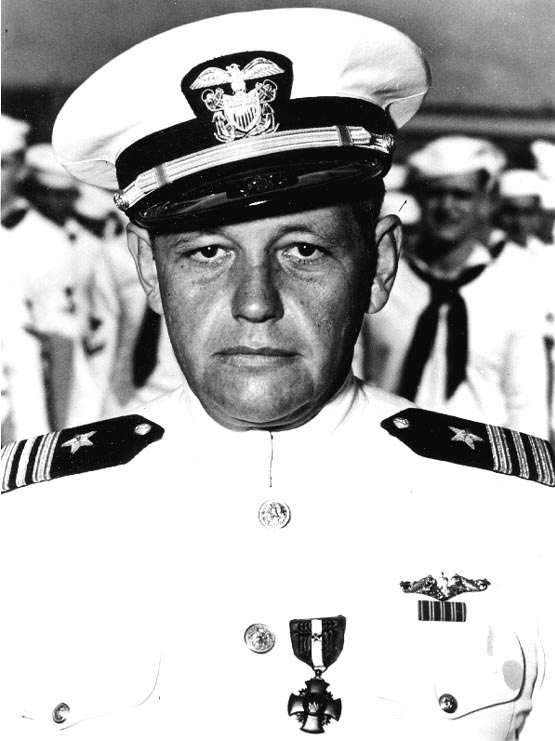 As a member of USS Enterprise’s VS-6 “Scouting Six,” he earned the Navy Cross for scoring hits on the Japanese carriers Kaga and Hiryu on 4 June, as well as the Japanese cruiser Mikuma on 6 June. In honor of Captain Kleiss and his heroic actions, the Naval Historical Foundation produced a brief video commemorating Kleiss. The video was produced in coordination with Kleiss biographers Dr. Timothy and Laura Orr and our partners at the Hampton Roads Naval Museum in Norfolk, Va.
Before the dinner began, International Midway Memorial Foundation (IMMF) President and Founder Dr. Jim D’Angelo made a special presentation to speaker David Jourdan and Dr. Jim Delgado, who is the Director of the Maritime Heritage Program at NOAA’s Office of National Marine Sanctuaries. For their tireless work preserving the memory of the Battle of Midway D’Angelo presented Jourdan and Delgado with National Midway Memorial coins. Marine explorer and author David Jourdan rounded off the evening’s festivities with his talk, “The Search for the Japanese Fleet.” This year’s lecture built on the intelligence theme of last year’s event, which Jourdan admitted was a “significant part of the story.” Using his knowledge as an underwater explorer and researcher, Jourdan based his informative talk on his 2015 book of the same name. Jourdan has become an expert on the battle and the heroic exploits of submarine USS Nautilus. His resume is fitting. A 1976 Naval Academy Graduate and career submariner, Jourdan is best known as the President and Founder of Nauticos, a company devoted to the exploration of the deep ocean. The rest, as they say, is history. Their aviators were able to put an end to the carriers Kaga and Akagi, both of which played a heavy hand in the attack at Pearl Harbor just six months before. Both McClusky and Brockman received the Navy Cross for their actions at Midway. The most interest aspect of Jourdan’s lecture was his discussion of the effect of depth charges aboard USS Nautilus during the Battle of Midway. Over the course of the battle, Nautilus experienced 42 such charges, all of which came during their very first war patrol and first engagement. These weapons, which Jourdan noted were the “most dangerous enemy” of the submarine, had the potential to cause the swift destruction of a submarine from the power of the hydraulic shockwave it produced. In the end, all you could really do is sit and stare at your shoes and hope you’d make it through it. As Jourdan said, “you didn’t want to see another man’s fear in his eyes.” Unlike most historians, Jourdan does not feel that luck played a key factor in the victory at Midway. To him, it was more a case of relentless brave attacks by American airmen and submariners on the fleet that caused the Japanese to be out of balance and without time to retaliate. He ended his talk with a brief overview of the 1999 exploration Nauticos conducted in coordination with the U.S. Naval Oceanographic Office to search for the lost Japanese aircraft carriers. By reconstructing the Nautilus patrol through their meticulous notes and deck logs, they were able to positively identify wreckage from the Japanese carrier Kaga using deep-tow sonar devices. Because Brockman had attacked that ship, Jourdan and Nauticos knew exactly where to search. Like Dr. Bob Ballard and the Ocean Exploration Trust, Jourdan’s myriad contributions to the field of underwater archaeology today are a reminder that the understanding and exploration of the Navy’s past is as important as it ever was. As we begin to celebrate and commemorate the 75th anniversary of the Second World War later this year, these contributions will not go unnoticed. Stay tuned to the Naval Historical Foundation for updates. We are one year away from the grand spectacle of the battle’s 75th anniversary. 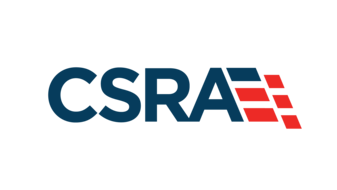 Mark your calendars for this fantastic event on 4 June 2017 at the Army Navy Country Club in Arlington, Va. A special thanks to the other dinner partners that help make this event a continued success: The Association of Naval Aviation, The Association of the United States Navy, the Naval Order of the United States, the Naval Submarine League, The Navy League of the United States, the Surface Navy Association, The Tailhook Association, the U.S. Naval Institute, and the U.S. Navy Memorial Foundation. I thoroughly enjoyed this article and remembering the commemoration. My father is Hank Kudzik and I have attended this event with him many times. It is always a fine tribute to those who contributed at Midway and to honor those who have sacrificed at Midway. It was such a great gift to have added to my experience of the Battle of Midway the critical impact of our submarines in general (the concern of the enemy with the numbers available to us), the significant importance of the steely presence and endurance of the USS Nautilus in particular (enabling the “pathfinding” SBDs to the targets) and the remarkable participation of Chief Kudzik also in particular (noting the “pre Pearl Harbor” ribbon on his chest AND his presence in this year’s commemoration). Even though I am a veteran qualified submariner, my knowledge and interest in this critical battle antedated my enlistment and was chiefly oriented toward the code breaking acumen, the excellent leadership of our fellow submariner, Admiral of the Fleet Chester Nimitz, the hefty contribution of those who enabled the participation of the USS Yorktown, the heroic sacrifices of the crews of Torpedo 8 and other torpedo bombers and of course the skill of who those who pounced on the remarkable (and I think God-given) opportunity presented by the clustered group of three of the six aircraft carriers which had been used during the day of infamy. Thanks to Chief Kudzik, the other veterans of that battle who sat for a picture at last year’s commemoration and all the other veterans who contributed so much AND VARIED service to our nation in June of 1942, the enemy was reminded that we are a people who quickly rise from the canvas and prevail to win. It would behoove all present day adversaries forgetful of this reality to “knock it off” before they join their foolish predecessors in Davy Jones’ Locker or other equivalent dust bin.